Clothing/Jewelry Description A brown and orange Hardee's jacket, a white Pepsi and Mountain Dew sweatshirt with three bears on it, blue jeans and pink sneakers. Medical Conditions Anderson is mildly mentally disabled. Distinguishing Characteristics Caucasian female. Blonde hair, blue or brown eyes. Anderson has a half-inch scar over her right eye from stitches. 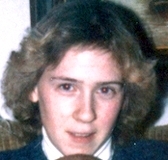 Anderson was last seen in Wadena, Minnesota on November 13, 1987. She was employed at a Hardee's restaurant at the time of her disappearance. On the day she went missing, she found out she had been named employee of the month at work. She and her mother and stepfather went out to eat at the Taco John's restaurant that evening to celebrate the honor. After dinner, between 7:30 and 8:00 p.m., Anderson's mother and stepfather picked up some movies for her to watch, then dropped her off at her apartment at Greenwood Apartments. It has been established that Anderson got safely inside her apartment that evening. She had been carrying a cup full of soda when her parents dropped her off. The empty cup was found in her apartment, and one of the videos she had gotten to watch was found in her VCR. Anderson did not show up for her morning work shift, which is uncharacteristic of her, as she was exemplary employee. She has never been heard from again. Nothing appeared to be amiss in Anderson's apartment and the only thing missing was her keys. The apartment door was locked from the outside. The building itself had a security door, but the door had been propped open that night by other tenants who were moving in. On the night of Anderson's disappearance, there was a fire burning in a swamp on the outskirts of Wadena. She would have been able to view the fire from her window. Authorities theorized she left home to look at the fire up close, and someone attacked her. There is no evidence to support this theory, however. That same evening, a brown Plymouth Horizon was stolen a couple of blocks from Anderson's apartment building and was never recovered. It is unknown whether the stolen car has any connection to her case. Anderson's loved ones stated local people sometimes harassed her or attempted to take advantage of her. Although she's mildly mentally disabled, she tried to lead as normal a life as possible and was proud of being independent and having a job and her own home. She also had a boyfriend who lived in Lake Park, Illinois. Suspected serial killer Floyd Todd Tapson was considered a possible suspect in Anderson's disappearance for a time, but he was cleared from that case after being interviewed by investigators. He is still a suspect in the disappearance of Kristi Nikle, a mentally disabled teenager who disappeared from Grand Forks, North Dakota in 1996. All the members of Anderson's family have been ruled out as suspects in her case, as was her boyfriend. Her parents both died in 2008. Foul play is suspected in her disappearance, but little evidence is available as to her fate. Updated 6 times since October 12, 2004. Last updated November 16, 2018; picture added.